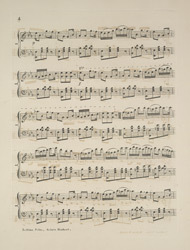 'The Lothian Polka' is piano music sold for use in the home. For many of the working classes, owning a piano was an expression of their social and financial success. By owning one they showed a desire for something more from life, and were 'one up' on their neighbours. Musical performances extended beyond the home for the labouring classes, local public houses often had a piano on which playing was encouraged and these noisy and raucous meeting rooms were popular with both men and women. Musical bars and singing saloons were the predecessors of the music halls.